It turns out that Tom Brady and Donald Trump have been friends for over a decade. After Tom Brady's four-game suspension was overturned on Sept. 3, one of the first people to congratulate Brady was presidential Donald Trump. So was Trump going after the Massachusetts vote with that tweet or is he actually tight with Brady? It turns out that the answer to that question is probably the second one. Two days after Brady's appeal was nullified, a Trump hat showed up in his locker at Gillette Stadium. During an interview with WEEI-FM in Boston on Tuesday, Brady explained how exactly the hat got there and how exactly he knows Trump. "He sent it to me," Brady said of the hat. "I've known [Trump] since 2002. I judged one of his beauty pageants. Imagine that, I was a judge at a Miss USA pageant in 2002." Since this is the internet, you don't have to imagine it. 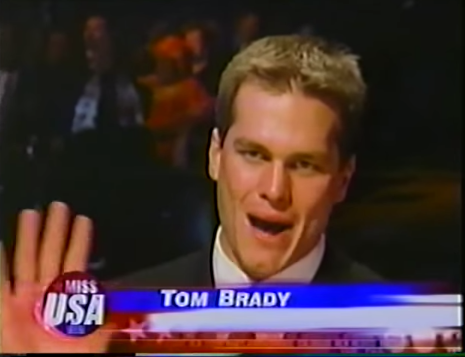 Here's a picture of Brady from the event, which was televised by CBS on March 2, 2002, less than one month after Brady won his first Super Bowl title. So Brady and Trump have been best buds for over 13 years now. Back to the hat though, because that story isn't over yet. Apparently, there was a middleman in the exchange. "[Trump] always gives me a call and different types of motivational speeches at different times and now that he's running for president he sent me a hat," Brady said. "He gave it to [Patriots owner Robert Kraft] a couple of weeks ago and it found its way into my locker." It sounds like Trump might do well with Patriots fans. So is Brady going to vote for Trump? "I don't know," the Patriots quarterback said. Brady's answer kind of makes sense if you think about it: There are 1 1/2 football seasons between now and the presidential election and Bill Belichick doesn't allow anyone in the Patriots organization to look ahead to anything. Brady's probably not even allowed to plan his breakfast for tomorrow because that would be looking too far ahead. Although Brady didn't commit to voting for "The Donald," the Patriots quarterback did offer Trump a few compliments. "He's a good friend," Brady said. "It's been pretty amazing what he's been able to accomplish as an entrepreneur and then, really, as a television star, and now he's running for political office. People who can do those type of things and transition into different arenas and still have that type of appeal and carryover. He's obviously appealing to a lot of people." But most importantly, "He's a hell of a lot fun to play golf with," Brady said. The next time Trump and Brady play golf, I'm guessing the entire conversation is going to revolve around Trump trying to get Brady to sue the NFL for $250 million -- and then donate it.